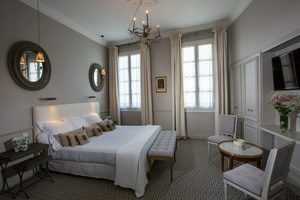 A magnificent 16th Century private mansion, completely re-modelled in the 18th Century, and continually modernised since then, Hotel d’Europe is one of the oldest hotels in France. In this unique setting, the hospitality from the professional and dedicated team is discreet and warm. In the 20th Century, many artists, actors and Heads of State have added their names to the hotel’s illustrious guest list. Picasso and Salvador Dali were both loyal customers in the post-war period. 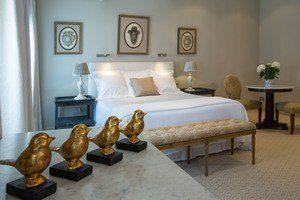 Jackie Kennedy also chose to stay here during her last visit to her family’s homeland in 1993, and the Presidents of India, Italy and France have all enjoyed the luxurious suites on the third floor. Just two steps from the famous Popes’ Palace, Hotel d’Europe is also located only 50 yards from the entrance through the ancient city walls. This central location is also the ideal starting point for a wine tour. 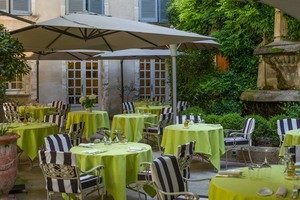 From Avignon, it is easy to explore and discover this magical region, including Orange, the Gard, Marseille, Luberon, Aix-en-Provence and Châteauneuf-du-Pape. The hotel has its own secure private car park for those arriving in Avignon by car. One of the the best features of Hotel d’Europe is its gourmet restaurant, la Vieille Fontaine. Headed by an award-winning local Chef, diners can expect mouth-watering regional cuisine using fresh ingredients. A hot and cold buffet breakfast is served every day and there is complimentary WIFI internet access throughout. A business centre, gift shop, daily newspapers and room service are also available to hotel guests. The 39 rooms and 5 suites at Hotel d’Europe are tastefully decorated and combine natural French elegance with the most exclusive luxury. They reveal a unique ambience and high level of comfort. They were designed and finished down to the finest detail, from the furniture to the choice of fabrics. 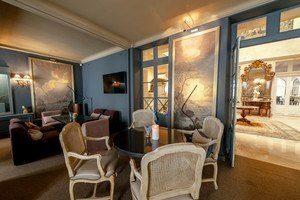 Guests are made to feel very welcome in a harmonious space made up of soft colours and elegant antique furniture, as well as comfortable chairs and modern, luxurious beds. Each room is equipped with a flat-screen TV with cable channels, heating and air-conditioning, a mini-bar, safety deposit box and an en-suite bathroom with a hairdryer and complimentary toiletries.